The purpose of this article is to investigate the importance of intertextual references in the films of one of Japan’s most successful contemporary comedy filmmakers, Mitani Kôki. Since Mitani consciously makes references to other films, intertextuality works as a key element to comprehend his works. 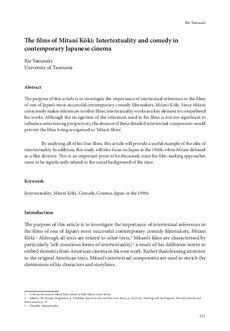 Although the recognition of the references used in his films is not too significant to influence entertaining perspectives, the absence of these detailed intertextual components would prevent the films being recognised as ‘Mitani films’. By analysing all of his four films, this article will provide a useful example of the idea of intertextuality. In addition, this study will also focus on Japan in the 1990s, when Mitani debuted as a film director. This is an important point to be discussed, since his film-making approaches seem to be significantly related to the social background of the time.